It got us thinking here at Robohub about the technology of tomorrow, starting to happen today. 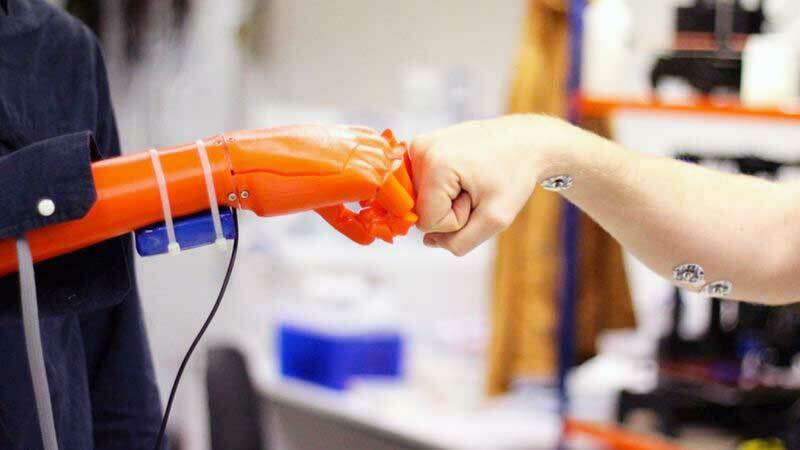 For example, recent research about how brain-controlled robots combined with virtual reality could help paraplegic patients feel and move their limbs, or that hand prosthetics and sensory feedback will provide amputees with the ability to manipulate objects. Not only will these advancements improve lives for the disabled, but some of the tech (like advancements in exoskeletons) could contribute to sports rehabilitation and preventative care, maybe even eliminate sports or work related-related injuries completely. In our Roundtable, we discussed how advancements in prosthetics could maybe help sports evolve, the importance of exoskeletons being used today, and difficulties that remain when trying to test new advancements. This Roundtable features Sabine Hauert, Kassie Perlongo, Ioannis Erripis, Frank Tobe, Maciej Pietrusinski, and Samantha Payne, all providing a range of perspectives across the board from academia, research, business, and the general public. Cybathlon is quickly approaching in October, how will the sports of tomorrow look? “Cybathlon is an exciting competition,” said Sabine Hauert, President at Robohub. “Especially in terms of showing how robotics can be helpful for people with disabilities, like in our SPARC/EURobotics article about exoskeletons. I think the goal is not to surpass human performance, as the general goal is not to provide superhuman powers,” she said. “It’s great that the Cybathlon is here! It’s a place to celebrate advances in assistive technologies and, at the same time, it’s a place that will highlight the shortcomings of technology,” said Samantha, COO Open Bionics. “Ultimately, Cybathlon will educate the greater public about the problems people with mobility face every day and the problems engineers are working hard to solve. I think it’s important to remember the research, engineering, and money that goes into creating these assistive devices. Whilst their functionality may seem limited, they are actually a vast improvement and it’s a great insight into what is coming,” she said. A glimpse of something to come in the future when it comes to training or rehabilitation? “Another area of interest is whether using exoskeletons would give an unfair advantage to certain competitors, in the sports of the future. How can we make sure everyone is on the same playing field? But, I can see how this could really help players who are injured, or substantially reduce recovery time,” said Kassie Perlongo, Managing Editor at Robohub. From the podcast: “They would have to detect high levels of stress and fatigue in biological structures and then tell the human to stop or to move in a different way. Imagine a world where our top athletes never injure. Imagine the impact to human athletic performance. Performance would just go through the roof, because often what mitigates top performance is injury and recovering from injury and not training harder because you might injure,” said Hugh Herr. Where does the technology stand today, what can we do well and what is still difficult? “When the greater public thinks about exoskeletons, they generally think of the robotic suits you might find in a Marvel comic,” said Samantha. “The reality is that with exoskeletons, we are just scratching the surface of this technology! Whilst they might look bulky and heavy now, it could be that in the near future exoskeletons become as subtle and as common as wearables are today,” she said. “It’s interesting. The designers of these devices are always having to compromise. Ideally, a robotic suit would be light, strong, flexible, agile, affordable, and have hours worth of power. However, this isn’t realistic at the moment. If you want a strong robotic device, you need decent motors which are heavier and expensive. If you have strong motors, you need decent power, but batteries are also heavy, take up room, and they won’t last for hours. So, your suit can’t be light. For the exoskeleton in the Marvel comic to exist in reality a number of technologies will need to advance and improve. The ultimate exoskeleton is dependent upon the progression of other technologies,” said Samantha. “In the public sector, these technologies are driven by the market. There is a large ageing population in the rich world, this will drive the development of assistive devices, so the elderly can keep and retain their independence and mobility longer,” said Audrow. “Also, large manufacturing companies like Boeing are interested in exoskeletons because they see that they can make their workers more efficient. I think that these forces will improve the technology allowing exoskeletons to enter other markets, such as fitness and recreation (e.g., super-human-powers),” he said. From the podcast: “I’m not sure there are technological bottlenecks. I think that largely the components are sufficient. It’s really a problem with design and architecture. The human machine interaction is something that’s unknown, so putting a bionic structure on a human and adapting its control in real time in a kind of human machine optimization is critically important to the future of this area of design. Imagine putting on a device and you just starting to walk and run and it adjusts its behavior to optimize its performance with you in a collaborative effort,” said Hugh Herr. From the podcast: “My definition of an exoskeleton is a device that attaches to the body, intimately to the body, that augments physicality. What I mean by augments, it enables a human being to do something that’s beyond natural capability for an innate, healthy body. The word orthoses is a medical term for a robot that attaches to the body that enables a person with a disability or some condition to move more naturally. Exoskeletons are wearable robots that augment,” said Hugh Herr. “For example, General Motors, which has been trying to adapt their NASA Robonaut hand to factory worker assistance, has partnered with BioServo Technologies, who developed a therapeutic glove, to make a factory-worker glove for workers who regularly grasp things. There are many other glove makers doing the same thing. Another example is Japan’s health ministry through Cyberdyne and other agencies attempting to empower seniors with exoskeletons to help them garden (squatting, reaching, kneeling and lifting) and be mobile with non-medical partial skeletons. Many university labs are working on variations on this,” said Frank. “This is similar for the psychological value assistive devices may provide users. There is no measure for how a device can bring confidence back to a user,” she said. Are these technologies about human augmentation (read super-human powers), or really about empowering those that are disabled, weakened. “I don’t see how it makes sense to give people super-human powers, aside from improving endurance (when carrying loads – HULC is an example),” said Maciej Pietrusinski, President and Founder for AndrosRobotics. “We already have examples of exoskeletons (non-antropomorphic) which give people the ability to traverse the landscape and cover 150 km in 2 hours (bicycle), and it does so without exposing our bodies to harm (except when we fall off the bike). “An exoskeleton that is meant to give us faster-running abilities would also subject our body to injury. Our bones get stronger with time as they are subject to higher stresses, partially as a response to our muscles growing stronger as we mature, and donning an exoskeleton to give us super-human speed or strength could result in an injury. So empowering the disabled is a much better use of exoskeletons,” said Maciej. Restoring functionality and living “as a normal two armed person” is what amputee Melissa Loomis states, in an interview on Motherboard. The technology being looked at called Modular Prosthetic Limb (MPL), interprets and converts signals from the body’s nervous system to motion. When the MPF interacts with an object, signals from over 100 sensors sends info back to the brain, creating a sense of touch. The pay-off is that Melissa will be able to access sensory information in her prosthetic. The arm learns how to understand what you want to do, as opposed to, you learning how to control the arm. What are the markets for this technology? The Roundtable thinks that areas in Industrial; Healthcare 1) rehabilitation 2) disabilities; Military; Entertainment (sports); and Services (renting exoskeletons to help at home) are all areas that could be considered for applicable for advancements in prosthetics, especially exoskeletons.